NETWORK FINALS: There were no changes from the preliminary numbers for Sunday. CABLE HIGHLIGHTS: Considering its pedigree, HBO’s BIG LITTLE LIES had an unexciting debut at 0.31, although its total viewers number was a bit better because it skewed rather old (its 50+ demo number was 0.63, more than double that demo for lead-out GIRLS). The latter show did get a modest boost, up 0.03 to 0.27, with the night’s other newcomer CRASHING at a mild 0.17, and LAST WEEK TONIGHT down a tick to 0.43. On Showtime, after HOMELAND rose 0.02 to 0.33 despite the new competition, BILLIONS returned at 0.20, not far from last year’s series premiere at 0.24, although more steeply down from the 0.32 season finale. (Note: both premieres were available via VOD/streaming before linear airing.) Hallmark’s WHEN CALLS THE HEART returned at 0.23. On E!, the season finale of THE ROYALS rose 0.03 to 0.20. 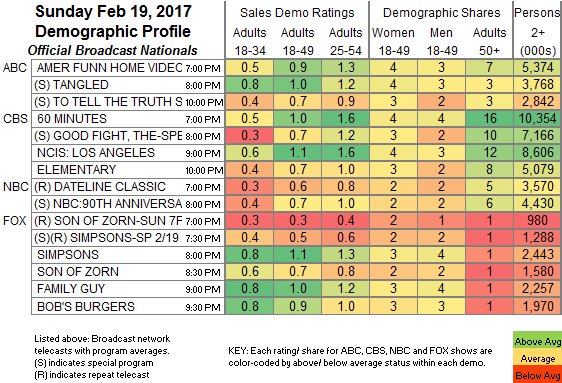 TLC’s LONG ISLAND MEDIUM had a 0.41 season premiere, followed by LONG LOST FAMILY up 0.03 to 0.27 and its AFTER-SHOW down 0.03 to 0.20. AMC’s THE WALKING DEAD was of course the night’s giant, down 0.44 from last week’s midseason premiere to 5.28, with TALKING DEAD down 0.33 to 1.82, and COMIC BOOK MEN down 0.04 to 0.36. Adult Swim’s SUPERMANSION gained 0.11 to 0.49. On Starz, BLACK SAILS dropped 0.03 to 0.12, and THE MISSING dropped off the chart, down 0.03 to 0.03/156K. The NBA ALL-STAR GAME was fairly steady with last year’s edition, down 0.09 to 2.63, with the TBS simulcast down 0.13 to 0.46. The TIP OFF special on TNT was down 0.23 to 1.30, with the TBS simulcast down 0.09 to 0.32. On Bravo, REAL HOUSEWIVES OF ATLANTA rose 0.05 to 1.05, and FIRST FAMILY OF HIP-HOP was up 0.05 to 0.39. On Food Network, WORST COOKS IN AMERICA was at 0.61, GUY’S GROCERY GAMES jumped 0.16 to 0.47, and CAKE WAR CHAMPIONSHIP ticked up to 0.32. ID’s EVIL LIVES HERE gained 0.06 to 0.40. 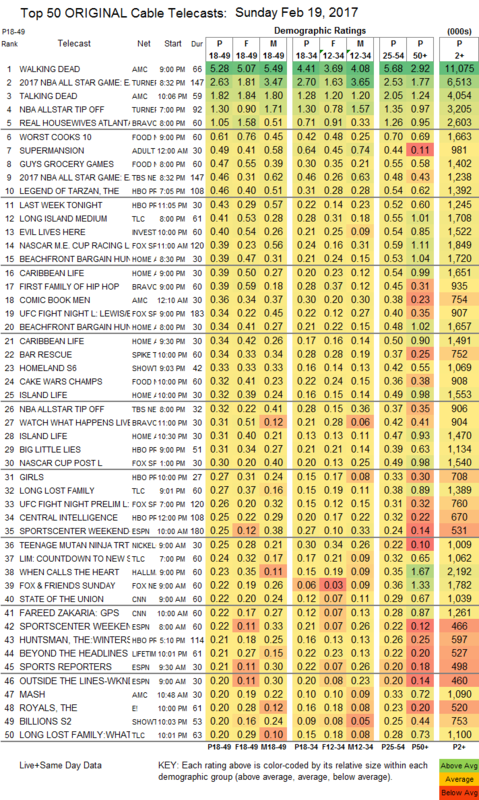 Fox Sports 1’s morning NASCAR race was at 0.39, and the primetime UFC FIGHT NIGHT was at 0.34.